With the holiday season of Christmas cat owners will really relate to having their cat tangled in Christmas lights, something about the tree and lights that attract a cat. On the front of this t-shirt you will see a cartoon image of a grumpy cat that is just sitting down all tangled in Christmas lights, of course to top it off on the head of the cat find the tree topper of a star. 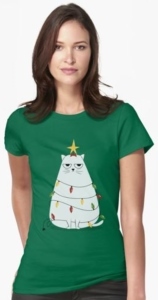 The cartoon grumpy cat tangled in Christmas lights t-shirt is available in a wide variety of women’s fitted sizes that range from Small to 2XL and choose from a huge selection of 18 different fun and unique colors. Now there is a festive Cat And Presents T-Shirt. 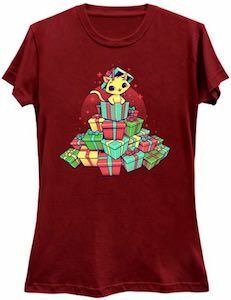 If you like a fun t-shirt for the holidays and you like cats then this is the t-shirt to get as it shows a big stack of presents almost like the shape of a Christmas tree. and the top present has a kitten inside it that is just popping out. You can get this funny cat t-shirt in styles and size for men, women, and kids and many sizes. And if you like the design but would prefer a Christmas sweater or hoodie of it then you are in luck as you can that too. If you want to be extra cool then you should be wearing this cool cat t-shirt. The t-shirt is available in many styles for men, women, and kids and comes in many colors and sizes. On this t-shirt you can see one cool cat or actually you can only see the drawings of it’s nose and ears and it is wearing some hipster glasses all because this is a cool cat. 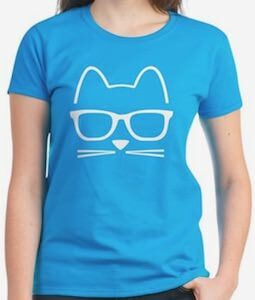 If you like hipster cats then wearing this t-shirt will be perfect for you and it is fun to wear for anyone that just want a fun t-shirt to wear. If you feel kinda low on Monday morning and you like cats then you just need to wear this Monday cat t-shirt on Monday morning. You can get this fun shirt in styles for men and women and it comes in many colors and in sizes Small – 6XL. 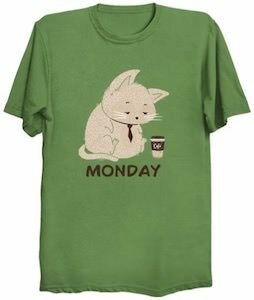 On the t-shirt you can see a cat that is wearing a necktie and it seems really down while staring at a paper cup of coffee and then below the cat it says “Monday” and that explains it all. If you feel as down as the cat on the shirt on Monday morning then you should wear this shirt on Monday morning so that people around it know how you feel and maybe get your a coffee. 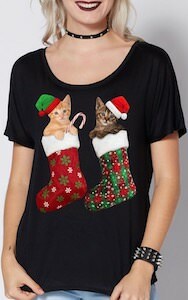 This Christmas you can show the world that you are a crazy cat lady. Just wear this cats in stocking Christmas t-shirt that is black and on the front, it has two Christmas stockings one that is green and one that is red and both are decorated and in the stockings, you can find two cats and they are bringing candy and wearing fun holiday hats. You can get this adorable Christmas t-shirt in women’s junior sizes Small – 2XL and it will be just amazing on you. Now is that time to get your shirt so that you are ready for the holidays. 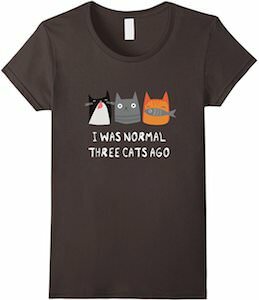 If you are a crazy cat person then you probably need this I Was Normal 3 Cats Ago t-shirt. The t-shirt is available in many colors and sizes and comes in styles for men, women, and kids so that the whole family can enjoy wearing one. On the shirt, you can find 3 cats of which one has a fish and below the animals, it says “I was normal three cats ago”. So now you just have to wear a t-shirt and the world knows that you are a true cat person and maybe even a crazy cat person. If you like cats and Halloween then this is the t-shirt to get. 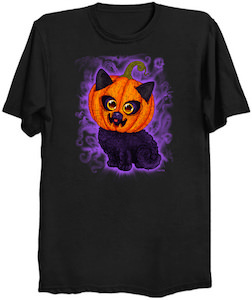 The Halloween cat t-shirt is available in many styles for men, women, and kids and comes in many colors and sizes. On the shirt, you can see a purple fog in the background and in front of it, you find an adorable cat sitting looking cute especially as it has a big orange pumpkin on its head. 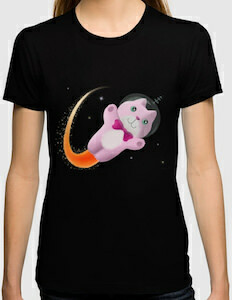 So now you can wear this perfect cat t-shirt on Halloween or just when you like to be spooky. And kids and adults can get this shirt so that the whole family can wear the same design shirt. If you like fun, taco’s and cats then this is the t-shirt you just need to have. You can get this t-shirt in many colors, sizes, and styles for men, women, and kids so that the whole family can enjoy this funny t-shirt. 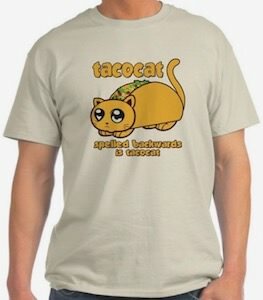 On the shirt, you can see a cat that looks like a stuffed taco and around the taco cat it says “Tacocat Spelled Backwards Is Tacocat”. It’s just fun and especially if tacos are the food of choice while your cat is napping on your lap. Surprise the world with this play of words and a taco that looks like a cat. This t-shirt is different as it shows a cat in a fighter plane and the animal is holding the weapons. It’s a real interesting t-shirt of something I hope never to see for real. 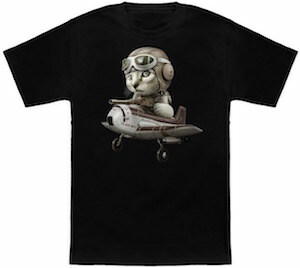 On the t-shirt you can see a plane with a big cannon and the cannon is held by a cat making the animal a fighter pilot. You can get this special kitten t-shirt in styles for men and women and it is available in sizes Small – 6XL and it does come in many fun colors too.